You’re tired, you just got in from work, if you have children they are probably ravenous, you’re also rather hungry, this is when many of us reach for the take away option or we could reach into the freezer for something pre-prepared. I try my hardest to get a few meals packed away in the freezer for these nights so I know we have some home cooked nutritious food to look forward to after a busy day. As the weather cools down I find there are lots of opportunities to prepare ahead and slow cooked dishes are perfect. Look for slow cook joints of meat that can be turned into 2 or even 3 meals for a later date. Slow cooking a shoulder of lamb is super delicious and by slow cooking I mean 10 hours at 100c! Pop it in the oven on Saturday night, by Sunday morning it will be meltingly delicious and ready for lunch. Place lamb in a large baking dish. Crush some garlic with salt in a pestle & mortar, add herbs (rosemary or thyme), smash it up a bit, add a good glug of olive oil. Season the lamb thoroughly with salt and pepper. Rub the garlicky oil into the lamb. Cover the lamb with a piece of baking paper then cover the entire dish dish with foil so it is well sealed. Pop it in the oven and off you go to bed. The next day the meat will fall off the bone, meltingly so. Unless serving a large gathering you will have lots of extra meat. You will also have the most divine lamb juices in the pan, pour these into a bowl and pop in the fridge, the fat will settle on the top (do not throw it away!). Take the cold lamb and either chop by hand or give it a quick blitz in a food processor or Thermomix (don’t over process). Sauté some carrot and celery in a little of the lamb dripping or olive oil until soft, add a tablespoon of tomato paste, cook for a minute then add a splash of red wine followed by those delicious reserved lamb juices and the chopped meat, bring to a simmer and check for seasoning. Gently cook for 15 minutes. At this point there are many ways you can go with this, I usually reserve some for a meal that night the rest I freeze ready to pull out when I need a speedy home-cooked meal. Pearl Barley Lamb Soup: Add to the lamb ragu base some barley a tin of chopped tomatoes, top up with water as the barley will absorb all the liquid, cook until barley is tender. Sometimes I add some finely chopped kale half way through cooking or baby spinach at the end. Serve with a grating of parmesan, drizzle of olive and a sprinkling of chopped parsley. Lamb Ragu Pasta: Simple really, toss the ragu through a little pasta, serve with a big bowl of green vegetables on the side. Lamb Ragu Pie: Depending on how many you are serving place the lamb ragu either in individual pie dishes or one large dish (one large dish is much easier for a family meal, less washing up!). 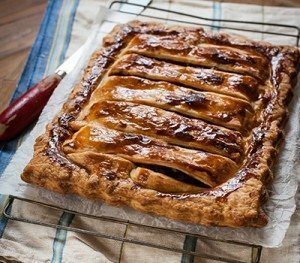 Cut squares of puff pastry (squares mean no trim) to fit the pie dish or dishes, brush with some beaten egg, pop on a baking tray lined with baking paper and in the oven at 200c for 15 to 20 minutes. Meanwhile cover you pie dish with foil and pop in the oven to heat the filling through, or you can do this on the stove top. When ready to serve place the pastry on top of the pie dish. 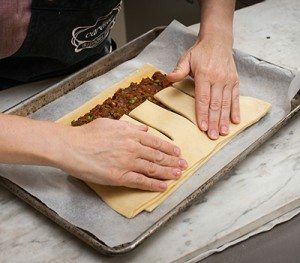 Lamb Ragu Slab Pie: On a clean lightly floured work surface, roll a sheet of the All Butter Puff Pastry to a 38cm x 38cm square. Cut one rectangle 17cm x 38cm for the bottom and place on prepared baking tray, the remaining 21cm x 38cm rectangle is for the top. 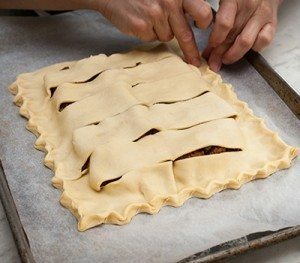 Spoon the cooled lamb ragu mix mixture evenly over the pie base, leaving a 2cm border. 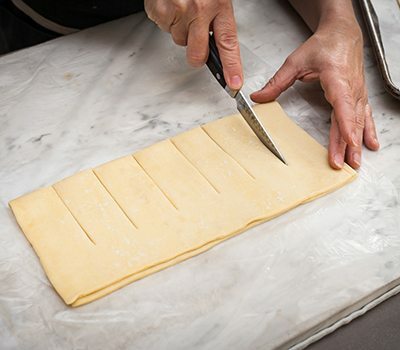 Add the extra sheet for the top, see example of a slab pie below. This doesn’t require the preparation of the lamb ragu, just simply shred the cold lamb and toss through some cooked freekeh. You could add a variety of vegetables, here are a few ideas: roasted beetroot with feta, grated carrot mixed with olive oil, lemon juice and parmesan, chopped cherry tomatoes and basil, partially roasted whole red capsicum chopped up with lots of fresh coriander and parsley, blanched broccoli, blanched then sautéed kale. To finish I like to add some crunch, either chopped roasted almonds or roasted pepitas or both. To dress pound some garlic with salt, add a splash of red wine vinegar followed by olive oil. Herbs… I always like to finish with fresh herbs, parsley, coriander, basil, tarragon, whatever is hiding in the fridge. Visit your local butcher for lamb shoulder, I always buy bone in but you can also use boned if you prefer.